Science and technology education have enjoyed a meaningful partnership across most of this century. The work of scientists embraces an array of technologies, and major accomplishments in science are often accompanied by sophisticated applications of technology. As a result, a complete science education has, in principle, involved a commitment to the inclusion of technology, both as a tool for learning science content and processes and as a topic of instruction in itself (American Association for the Advancement of Science [AAAS], 1993; National Research Council [NRC], 1996). These elements have traditionally been a part of teacher education in secondary science. Science education has generally involved teaching not only a body of knowledge but also the processes and activities of scientific work. This view has linked the scientific uses of technology with hands-on experiences. The term “hands-on science” was descriptive of the major curriculum reform projects of the 1960s and became a label for a revolution in teaching science through the next two decades (Flick, 1993). So-called “hands-on science” instruction impacted teacher education as new curricula made its way into preservice courses. Teacher education was also influenced by teaching methods, such as the learning cycle (Lawson, Abraham, & Renner, 1989), based on theories of student learning that implied the necessity of interacting with physical materials. Flick, L. & Bell, R. (2000). Preparing Tomorrow's Science Teachers to Use Technology: Guidelines for Science Educators. 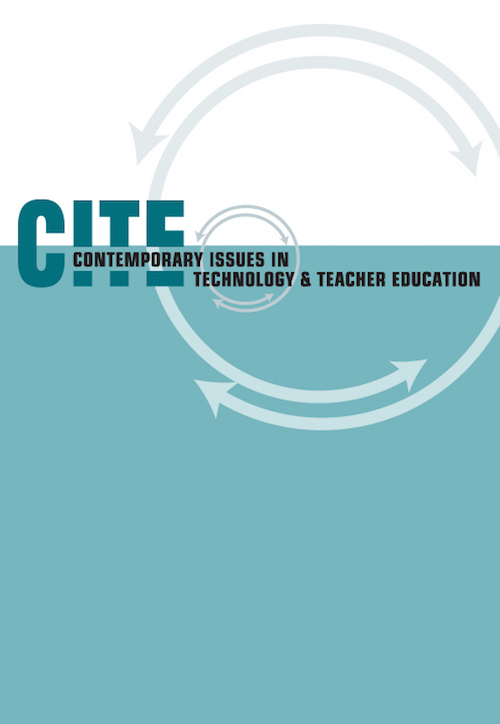 Contemporary Issues in Technology and Teacher Education, 1 (1), 39-60. Charlottesville, VA: Society for Information Technology & Teacher Education. Retrieved April 25, 2019 from https://www.learntechlib.org/primary/p/10803/. American Association for the Advancement of Science. (1989). Project 2061: Science for all Americans. Washington, DC: Author. American Association for the Advancement of Science. (1993). Benchmarks for science literacy. New York: Oxford University Press: Author. Baxter, G. P. (1995). Using computer simulations to assess hands-on science learning. Journal of Science Education and Technology, 4, 21-27. Borich, B. D., & Tombari, M. L. (1997). Educational psychology: A contemporary approach. New York: Longman. Bybee, R.W. (1997). Achieving scientific literacy: From purposes to practices. Portsmouth, NH: Heineman. Cavalli-Sforza, V., Weiner, A. W., & Lesgold, A. M. (1994). Software support for students engaging in scientific activity and scientific controversy. Science Education, 78, 577-599. De La Beaujardiere, J., Cavallo, J., Hasler, F., Mitchell, H., O'Handley, C., Shiri, R., & White, R. (1997). The GLOBE visualization project: Using WWW in the Classroom. Journal of Science Education and Technology, 6, 15-22. Fisher, B. W. (1997). Computer modeling for thinking about and controlling variables. School Science Review, 79, 87-90. Flick, L. B. (1989). "Probing" temperature and heat. The Computing Teacher, 17(2), 15-19. Reprinted in the Fourth Annual Conference Issue 1990-1991. Flick, L. B. (1993). The meanings of hands-on science. Journal of Science Teacher Education, 4(1), 1-8. Also reprinted in Rezba, R. (1994). Readings for teaching science in elementary and middle schools. Dubuque, IA: Kendall/Hunt Publishing Company. Goodrum, D. (1987). Exemplary teaching in upper primary science classes. In K. Tobin & B.J. Fraser (Eds. ), Exemplary practice in science and mathematics teaching. Perth: Curtin University of Technology. Kranzberg, M. (1984). The wedding of science and technology: A very modern marriage. Technology & Science. Davidson College, NC, 27-37. Lawson, A. E., Abraham, M. R., & Renner, J. N. (1989). A theory of instruction. National Association for Research in Science Teaching Monograph (No. 1). Lewis, E. L., Stern, J. L., & Linn, M. C. (1993). The effect of computer simulations on introductory thermodynamics understanding. Educational Technology, 33, 45-58. Minstrell, J. (1982). Explaining the "at rest" condition of an object. Physics Teacher, 20, 10-14. National Research Council. (1996). National science education standards. Washington, D.C.: Author. Novick, S., & Nussbaum, J. (1981). Pupils' understanding of the particulate nature of matter: A cross-age study. Science Education, 65, 187-196. Palincsar, A. S. (1986). The role of dialogue in providing scaffolding instruction. Educational Psychologist, 21, 73-98. Rogers, L. (1997). New data-logging tools—New investigations. School Science Review, 79, 61-68. Svec, M. T., Boone, W. J., & Olmer, C. (1995). Changes in preservice elementary teachers physics course. Journal of Science Teacher Education, 6, 79-88. Sabelli, N. (1992, April). Sharing multiple complementary representations in teaching. Paper presented at the meeting of the American Educational Research Association, San Francisco. Schwab, J. (1962). The teaching of science as enquiry. In The teaching of science (pp. 1-103). Cambridge, MA: Harvard University Press. Shulman, L. S. (1987). Knowledge and teaching: Foundations of the new reform. Harvard Educational Review, 57, 1-22. Kendall/Hunt. Songer, C. & Mintzes, J. (1994). Understanding cellular respiration: An analysis of conceptual change in college biology. Journal of Research in Science Teaching, 31, 621-637. Thornton, R. K. (1987). Tools for scientific thinking—Microcomputer-based laboratories for physics teaching. Physics Education, 22, 230-238. Thornton, R. K., & Sokoloff, D. R. (1990). Learning motion concepts using real-time microcomputer-based laboratory tools. American Journal of Physics, 58, 858-867. Tobin, K., Treagust, D.F., & Frasier, B.J. (1988). An investigation of exemplary biology teaching. American Biology Teacher, 50, 142-147. Williamson, V., & Abraham, M. (1995). The effects of computer animation on the particulate mental models of college chemistry students. Journal of Research in Science Teaching, 32, 521-534. Wolpert, L. (1992). The unnatural nature of science. Why science does not make (common) sense. Cambridge, MA: Harvard University Press. Can We Model Wiki Use in Technology Courses to Help Teachers Use Wikis in their Classrooms?